Like many other families, my husband and I are constantly on the go. If we aren't driving into Louisville every other weekend, we are on the road visiting our parents in Owensboro. A few times a year, we are also traveling for business. While my husband and I both work from home, he every so often has to drive to New Jersey for meetings or important events at work. Since we both love to drive, this really isn't a big deal for us and we usually do the 10 – 13 hour drive in one go, only stopping to switch drivers so we don't get fatigued. The only problem with this, however, is that we eat much more fast food than we like since it is what can easily be found on the road. If you are anything like me, you are likely wondering why we don't just pack our own lunches. Well, until recently, it wasn't something easy for us. We had packed lunches in the past only to have massive spills or just lose too much room. Since both of us are trying to lose weight, I was determined to find some solution to our eating problem while traveling – something that was compact and easy to handle in the car. After doing some research and talking to my friend Tara, I found the perfect solution – ECOLunchbox. Wanting to know more about their products, I reached out to them, and they were excited to have us review one of their stainless steel sets and cotton bags. When it comes to unique little containers, I have to say that ECOLunchbox really knows its stuff. I have seen quite a few bento boxes in my life, many of which were small, cheap pieces of plastic. What really makes the EcoLunchbox so unique is its size. I had never seen a stainless steel container that could fit so much food without being terribly heavy. Even better, the clips are easy enough to attach and remove with one hand, making it perfect for eating on the go. I especially loved that it was big enough to hold a sandwich, something I had never seen with this style of box. As you can see from the pictures, this box really can hold quite a bit, making it perfect for busy men and women on the go, or as the perfect compact lunchbox for kids. For me, it was perfect on my recent trip to New Jersey with my husband. Since I brought the Reya puppy with me, I have been spending more time outdoors and traveling about. While this may not sound like a big deal, most businesses aren't too keen on bringing a dog inside their establishment, meaning that I had very few options for food. Rather than leave her behind or do drive through, I filled my ECOLunchbox with food from breakfast, making it the perfect lunch as Reya and I were traveling about. Really, who wouldn't want such a versatile lunchbox? Out of everything I received from ECOLunchbox, the Furoshiki Eco Knapsack is by far my favorite item. Like most women, I love collecting bags. I have not only a selection of cute purses, but totes, duffle bags, and unique, interesting bags. I think this falls in the last category. I'll also freely admit that the geek part of me that loves Japanese culture also fell in love with this bag, having known what the bag was before I even saw it. I had just never seen one that was this cute! In my opinion, it is the perfect size for lunch, trips to the store, or even as a cute purse! What really makes ECOLunchbox's bags so unique, however, is how they are made. 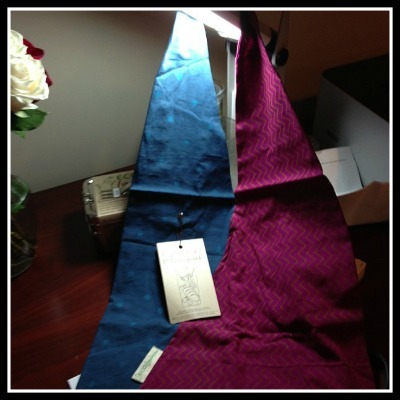 The fabric used for their bag is made using colorful fair trade textiles. This unique fabric is hand block printed by artisans in India who have been using this technique for generations. This makes the fabric unique and fun! Since they only get a limited run of these fabrics, it is unlikely you are going to run into many people with a bag just like yours! Okay, who doesn't like sporks? When I first opened my review pack and found this spork, there was only one word that came to mind – adorable! It has to be the smallest spork I have ever seen, but also one of the most well made, making it the perfect addition to any lunch set. Since it can be thrown in the dishwasher, it is perfect for kids and adults alike. I also love that its small enough to fit in a purse, making it perfect for yogurt treats on the go! For my own experience, I have to say that I am very impressed with ECOLunchbox's products. The stainless steel bento style lunchbox is very easy to use and is really the perfect size for adults. I have honestly never seen one that was truly big enough to hold a sandwich or an adult portion. It is even dishwasher safe, making it perfect for busy families like my own. Best of all, every product sold at ECOLunchbox is practical and fashionable without costing too much, making these items perfect for parents on a budget. Since I enjoy these products so much and am impressed with their overall quality, I can happily give ECOLunchbox an A+ rating! Want to purchase some new lunch items for yourself or your children? You can find ECOLunchbox's entire selection of containers and cotton bags on their website. At ECOLunchbox, you can truly make lunch healthier for your entire family! 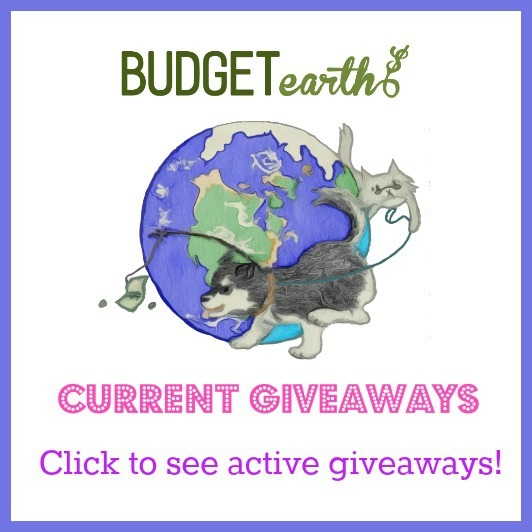 Disclosure: Budget Earth did not receive compensation for this review but did receive free products from ECOLunchbox for review purposes. All opinions on this product are my own and may differ from our readers' opinions. I’m so glad you liked the review! I’m someone who is constantly on the go and just don’t have time to deal with poorly made products. I also refuse to travel with plastic containers. The mess isn’t worth it and they are just…well…nasty! I might need this! My husband never warms up his lunch in the microwave and this would be so perfect! 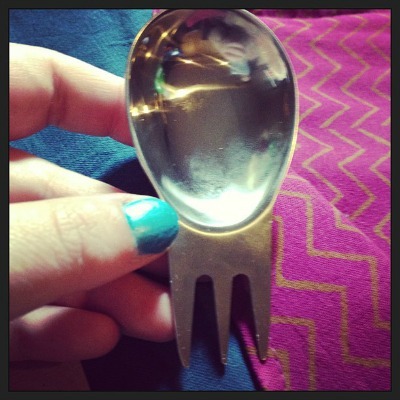 That spork might be the cutes utensil I’ve ever seen! I know! These little spork is adorable and practical. As you can see, it is the perfect size to even fit in the box. I love that it's stainless steel. I really don't like putting warm food in plastic because I'm concerned about chemicals leaching out. I've packed glass in my own lunchbox before, but I can't do that with my kids. I really like using stainless steel. The downside is that it can’t be put in the microwave, but most plastic containers say NOT to put the min the microwave. I found the ones that are suppose to be safe also warp. Once that happens, I’m scared to use them! They are really awesome for guys. They remind me of camping equpiment, actually. Thanks for the review. I have been slowly replacing all plastic in my house with stainless steel and have been eyeing the eco lunchbox as the next purchase for my son. I would love to have this for him for his school lunch starting this fall. It seems to be a wonderful and well made product. I've never seen anything like it before. I like that it's stainless steel. Does it keep food cold or hot? I'll check it out. Thanks. I found from testing that it keeps food hot for about an hour to two hours after its been put in the container. It seems insulate things fairly well. For cold, I’m not really sure the last time I used it with cold food I threw it in an insulated bag (my Mighty Nest bag). It reminds me of the stacked lunches on PBS delivered in India and keeps the food hot. I like the way the Eco Lunch Box pieces nest together. That looks awesome for my husband for work! I'm so sick of using plastic and paper bags for him. Thanks for the review! So glad you enjoyed the review! I wish I had this when I was teaching! I absolutely hate plastic and would love to win these stainless steel containers for my daughter's lunchbox. I have a few stainless pieces that I already use and would love a few more to add to my collection so I don't have to keep washing the same ones everyday! I really hate plastic too. Its such a mess and I worry about what happened to it over time. Its also nice that these containers are just so easy to clean! As someone that regularly packs lunches, I absolutely love the idea of this product! I try to avoid using plastic whenever possible and usually make the most out of mason jars when possible. The idea of stainless steel would eliminate the concern of the glass containers getting banged around and possibly broken. I've had this lunch box on my wish list for a while. Paired with the gorgeous bag it would be even more amazing to have! The ECO Lunchbox sounds like the perfect solution for my 6 year old grandson. He absolutely refuses to even try the school lunches, which sound pretty nutritious. It has been a struggle coming up with a lunchbox that is kid friendly that I feel good about – this sounds perfect! Those bags are beautiful. I really like he blue/turquoise one. Very trendy and elegant. I worry about containers being sturdy, but Hesse would be great for keeping food contained and separated and be durable enough for traveling. I love this idea! So cute and compact yet will fit a good sized lunch in it love it! So perfect for traveling, picnics….and I love the Japanese-style "lunchbox" – so pretty and not run-of-the-mill. Sure would make any airplane seat-mate jealous if you pulled this out for a meal on a flight where there was no food served! The Eco Lunchbox is very neat and seems to be very space conscious, I like that the trays are made of stainless steel which is dishwashable and makes it unbreakable which is what happens to glass containers in lunch and I like that the lunch bag is made of fair trade artesians in India. These are very neat and compact and of course the spork is cool. Stainless steel is my first choice when packing my kids school lunch. I currently use bamboo cutlery, but the stainless spork looks great because it doesn't take up so much room! Finally something well made that will last along time. 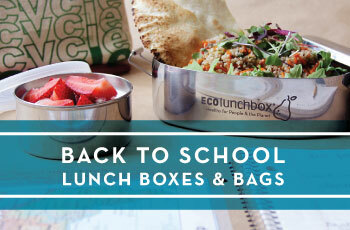 These staineless steel Eco Lunchboxes are awesome and the spork is too cute. This set is perfect for lunches or just on the go and so convenient. I love these! I'm working on what to pack for my daughter's lunches this fall and have been shopping around for something like this. These look great! I love that the fabric is fair trade, and that they stainless steel is safe to use, wears well and is easy to clean! This is awesome!! I had no idea there were these options out there! I've never seen a complete lunch set in stainless steel before. I is too pretty to use lol. My daughter just got her first job and has been taking her lunch. She has been wanting to get one of these sets so she doesn't throw away so much. I have to say that they are really nice. I really wish I had one of these sets when I was teaching. I produced so much trash using paper bags and plastic! I have been really interested in going green anyway that I can. This looks like the perfect way to do that very thing. never really though about a healthy alternative for packing lunches. Looks great and is really making me think now that my son starts school. These are so cool, I wish I had them back when I was in school, but my daughter will need one soon! So I am going to check them out forsure! I'd love this – I'm slowly planning to replace all of my plastic with glass and stainless containers. I'd love to try this brand out! Since the glass and stainless are so much more expensive, I don't want to get a bunch of a brand I don't end up liking! I think it is great that we are moving away from plastic! I want one. I absolutely love their fabrics! they remind me of my travels… and the stainless is great, especially with kids… they cant wreck it or break it and if they stash it somewhere it doesnt soak up old food stink! we've been trying to switch over but it takes a while on a budget! Quitting plastic is a good idea, but I've not seen such a good alternative until now. Kudos to Sandra Harris, and to Rayven for this giveaway! They really are neat products! I am always picky about what I buy and am looking forward to buying more when I have kids! I may not use these for food much, though they look very useful for keeping luncyh nice and fresh. I bead and I have cats, I love containers with lockable lids, the cats can knock over my beads and the locking lids keep me from losing my beads all over the floor. When my daughter was taking her lunchbag to school every day, I always wondered if she or her lunches were being exposed to chemicals. These sound great for everybody to use on a daily basis! This lunchbox would be awesome for my job. I drive a schoolbus and do 3 routes a day with about an hour between routes which leaves me eating fast food between routes and gaining lots of weight. This lunchbox will allow me to pack my own food which is incredible. This is a school bus drivers dream. I so wish I knew about something like this when I was teaching. It really is the dream of anyone who works in the schools! It's so cool: it's stainless steel and keeps the food warm for about 2 hours! Love the review and I am dying to purchase these products …I can not stand plastic so these would be perfect for my husband and I in our travels …And I just have to have that ADORABLE spork!!! I want one of these lunch boxes so bad! My husband always takes my other storage containers for his lunch and never brings them back. He wouldn't be allowed to touch my Eco Lunchbox!! What a great idea and love the way they look & that it helps the planet by reducing paper bag usuage. I prefer stainless steel over plastic. I'd much rather use, wash and reuse instead of dispoing of plastics. what I like about this product is that the stainless steel is so much easier to clean and keep sanitary than plastic. Also no staining. Never heard of these so thankyou! I like the stainless boxes, but I REALLY like the bag. Beautiful. I know! The bag is just too cute! In this India, this type of lunch box is mostly available and people would buy this one everytime. Great review…. I absolutely love this! not only does my son usually take a lunch to school, but I also have occassion to pack a lunch or a snack when attending fiber guild workshops or when I will be gone from the house for the day. If it is a food we want to eat warm I try to cook it or pack it warm so there is no reheating involved. I do not like reheating things in plastic of any kind. I love being able to reheat food but reheating in plastic always makes me nervous. I try packing things that don’t need it when I eat out for that reason. Stainless steel is my favorite reusable material; no BPA, dishwashable and long lasting. I think my favorite is the spork! It's so cute and practical. Thanks for the great review. thanks for the review. i really love this stainless steel lunch kit. i have been wanting a stainless steel set and this seems perfect. the eco lunch box sounds like a good product. it would be a great way for me to carry my lunch to work. I like these but wonder if the clasp is preschooler-friendly. A friend of mine keeps a set in the car for taking home restaurant leftovers instead of Styrofoam. This is a really neat idea & a great way to avoid environmental waste. I like the 3 in 1 set and that it's stainless steel. It's useful. I really love the look of it too! Very neat lunchbox! I have seen the bento-style boxes in various places, but only in plastic. These are the first stainless steel I've seen. I don't mind plastic too much, but I do worry about putting hot things in it or tomato-based dishes that would possibly melt it, so these look like a good option. Thanks for the review! I have one for one of my sons and it is awesome. Need to get another one for my other son who will be starting school. This would be great for my daily lunch at work. I usually have my lunch in the work van, so it would come in handy. The spork is a nice design. These are so cute and functional looking. I love this and my daughter loves anything that is cute! I love the spork too, so different. I love eco-friendly products! These look great! I am tempted by these. So sick of throwing away plastic containers after they get ratty so quickly. I love this! I've been looking for a new lunchbox to try and save money by bringing my food, and I really like the idea of this one being eco-friendly. Great review! The bag looks fantastic! I have one of these lunchboxes, but it didn't come with the adorable spork (I'm a tad jealous). It seems like the steel its made of is better quality than my tiffins from a different company (they tend to rust, and that company makes bamboo "silverware" which falls apart after a short time). I really like my EcoLunchbox. The only things I would change are 1) the bottom section is a little too shallow once you nest the top section on, so the little rectangular snack container only fits in the top, and a sandwhich gets squished if put into the bottom 2) I would LOVE the option to stack a third or even fourth tier. I like to pack a variety of foods for lunch, and additional sections that lock together would be amazing!.. then they could also have perhaps small square containers similar to, but smaller than the snack container, for dipping sauces like dressing, hummus, & peanut butter. That would be great! I think a 4th tier really would be great for dipping sauces. I think I might need something like this. I like that it's stainless steel since everything else I see is plastic. Thank you for your review! I love the fact that the lunchbox can hold a decent amount of food. The cloth bags are gorgeous. Thank you for all of the pictures. I was glad to hear the fabric is fair trade. I love this stainless steel lunchbox. I'm always driving back and forth taking the kids to school and practice, this would be great for me to pack my own lunches on the go. I love how compact this is!! As a mom who has been working to cut plastics out of our life this lunch set seems like a great addition and a perfect fit! Add to it the fact that the bags are fair-trade OMG fantastic!. I love their products and I use their small containers for lunches for work. I'm glad that I am not wasting and hurting the enviroment by using these products. I love the entire line they offer. With my hubby working on all of the Ohio Bridge Projects, this would be perfect for him. Plus, Eco-friendly products always gain my attention. Nice blog by the way. You must not be far from me. I live in Madison, IN.. I absolutly love these lunch boxes! Thank you for the review! I enjoy entering the give-aways even though I have never won one but I enjoy even more getting to find and explore new items such as this! I think all of my christmas shopping is going to be done from reviews such as this! I love this. I hate using plastic and I'm always nervous of carrying glass containers around. I love stainless steel. Now if we can only get all of our work places to use toaster or convection ovens instead of microwaves! This review was very informative. My daughter is starting kindergarten this year and we really have been trying to decide what the best way to go is as far as lunch boxes. Thanks for the advice on this one. Great review, and what a great idea! I often take cold stirfry to work for lunches, and it hardly needs to be said that a stainless steel lunchbox with insulating properties is a better option than cool-whip and cottage cheese containers! I absolutely love the quality of the stainless steel! Does not ding or look banged up! Very nice for lunches for all ages! These are so stylish! I love reusable containers for my kids' lunches. I especially like the Spork that comes with this set! I love the idea of being more green. I have been trying to become a more green household. I also love the look of the lunch box. I love this! It reminds be of the containers I used to use to pack my husband's lunch in India….they are called tiffins there. So handy! I'm a big fan pof packing lunches and of using reusable containers. We seem, however, to have a lot of random plastic lunch and snack containers that don't always fit well together, and we need a new lunch box–two, maybe, with two kids who'll need packed lunches this year! And wow, love that knapsack. PLUS: My 5-yr-old has long wanted a spork. This one is just too cute. I love the look of these lunch boxes. I love that they are thinking of the environment we all need to start doing this a lot more. I am convinced that I need these bento boxes for my husband's lunch for his sandwiches! I love all the neat containers coming out now for lunches and this one is great too. I love that it is made of stainless steel! That sounds great and with two of us taking a lunch almost every day it would be great. I really like the utensil that comes with it too as plastic silverware doesn't hold up and who wants to bring your actual silverware to be lost? I would give this a try.I think my kids might like them. Wow what a great idea for lunches on the go. As a single mom with 4 girls it is often hard for me to afford eating out on the road with my budget. This would be an excellent way for my kids and I to eat on a trip and wouldn't cost so much. That is an awsome lunchbox. I have been trying to be better at making things more reusable with my kids' school lunches. That would be a cool thing to have. Wow, this is cool! I've never seen anything like this. It would be a great way to send lunches with my husband every day!